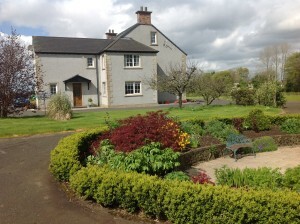 Our Co. Antrim Bed & Breakfast Accommodation was recently constructed to a high standard and offers a choice of 4 guest bedrooms, 3 with full en-suite facilities and one with private bathroom (alll with shower facilities). All rooms have free BT wired and wireless internet, flat screen TV (with built-in wireless internet access), hospitality tray, fridge and desk as well as guest lounge room for relaxing or living room with 55″ Samsung top of the range TV. Most importantly we strive to have the most comfortable beds and enjoyable breakfasts to set you up for the day. Ensuite rooms have towels & range of toiletries. Hair dryers provided and iron & ironing board available. A range of breakfast is on offer including the full Irish Breakfast and we endeavour to cater for special requirements. Please note that a cooked breakfast is only served after 7.30am. We have ample car parking as well as storage for bicycles and canoes. Being only a short drive from the Belfast International Airport, we offer a pick-up service from and to the airport for our guests.